Throughout the entire bible, the list of passages goes on and on with such teaching and encouragement. The truth is, every aptitude that we have, our vocation, every possession, every relationship in our life, and every imaginable blessing, all comes from God. And may God have mercy on us and help us, if we’ve fallen into the destructive delusion that any blessing in our life came about because we deserve it. We may have worked hard to get the things that we have, but the truth is, there are people around the world who are far more resourceful than we are and who work much harder than we ever imagined…working their fingers to the bone from before sun-up till after sun-down to feed their poor families, making no more than about $2 per day. If we step back a moment to take a realistic look at it all, most of the world would see us as blessed far beyond anything they could imagine. We are indeed blessed! So, if God’s blessings to us aren’t because we deserve them, then why does God bless us so immensely? It’s because He entrusts us with the responsibility of managing those blessings for the blessing of others’ lives, for the building up of His Kingdom—in other words, drawing other people towards making Jesus Christ King over their hearts. But what does that look like? Although it can take on a myriad of characteristics. Here’s just one beautiful example of what it looks like to have this attitude as the center of your life. 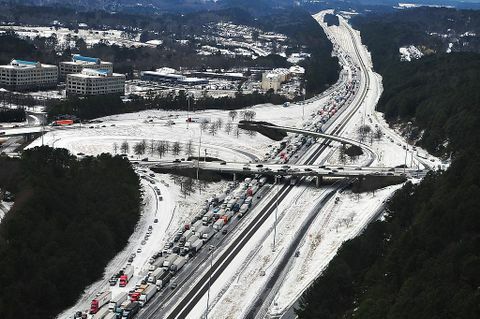 In January 2014 a snowstorm struck parts of Alabama, resulting in highways being shut down as drivers, inexperienced and unprepared for traversing such winter weather conditions, were unable to continue, leaving many motorists stuck on icy roads for several hours. The mainstream media showed footage of miles of cars stranded on the frozen interstates. Several national news broadcasts reported on school kids trapped on busses for almost 24 hours because of all of the dangerous ice. Imagine how frantic their parents were, wondering about the condition of their kids. It was a pretty tense situation. And that’s when employees of a Birmingham, Alabama, Chick-fil-A restaurant unexpectedly stepped in with acts of assistance to stranded people. The store’s owner, Mark Meadows, had closed early the day of the storm and sent all of his team home for the sake of their safety. However, they all soon discovered that none of them would be able to get home, because of all of the stranded motorists stuck on the roads. They discovered that some of the cars nearest the restaurant had already been stranded for up to 7 hours. Instead of just passively waiting out the storm, Meadows and his team of people fired up the kitchen and began preparing chicken sandwiches as fast as they could. They prepared several hundred sandwiches and then Meadows and his staff headed out to distribute hot meals to the stranded motorists on both sides of Highway 280, as far as they were able to walk. However, Meadows and Pitt were not through with their Good Samaritan efforts. They also helped push cars off the roads, up inclines and whatever else they could do to help. Then they kept the restaurant open overnight so that stranded motorists could have a warm place to be. A number of motorists slept in restaurant booths or on the benches. Their actions were truly generous and heroic, as they also braved the frigid temperatures to hand out hundreds of hot meals to complete strangers. This is a company, whose philosophy is built on the Christian principle of being good managers of God’s blessings for the sake of His Kingdom. Of course, this attitude should permeate every touch-point of our lives, so that whatever we put our mind to think upon and whatever we put our hand to accomplish, it should be to accomplish our Lord’s purposes. We’re all managers of God’s grace…fiduciaries of the blessings He gives us to benefit His Kingdom. Some of us are good, trustworthy managers of God’s blessings, and some of us are self-serving managers of God’s blessings, trying to cheat Him out of all the things He’s entrusted to us. Which kind of manager are you? Are you being honest with God’s grace?